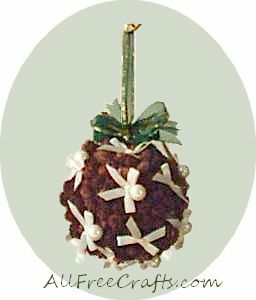 Top a pine cone ball with a sprig of mistletoe to make this easy pine cone kissing ball. Hang it in a doorway, under an eave, or from a light fixture to make a romantic place where guests, family – and, of course, you and your beau – can share a traditional Christmas kiss. Using hot glue, cover the entire ball with pine cones. Make small bows using a 1/4 inch ribbon [number required will vary]. I used about 20 bows and berries. Randomly glue a bow and a berry as shown in photo over the pine cone covered ball. Create a hanger and bow with decorative ribbon and glue to the top center of your ball. Glue a piece of mistletoe to either the top center or bottom center of your ball and that’s it, you’re all done! If you’re short on time, replace the handmade bows with small silk ready-made bows.